View from the Cafe Limani, Koufonisia port. ( I cant see any ferryboat, only a warship! It's 1:30 pm on Friday afternoon, we have just been driven to the port by Florian. Yineka-mou and I are, sadly, having to say goodbye to Koufonisia after just over two fantastically enjoyable weeks here. We are now going to get the seajet ferry to Naxos, there catch another ferry to Piraeus, to spend a few nights in Athens, before flying to Toulouse in the South of France, where we'll be for 2 weeks. 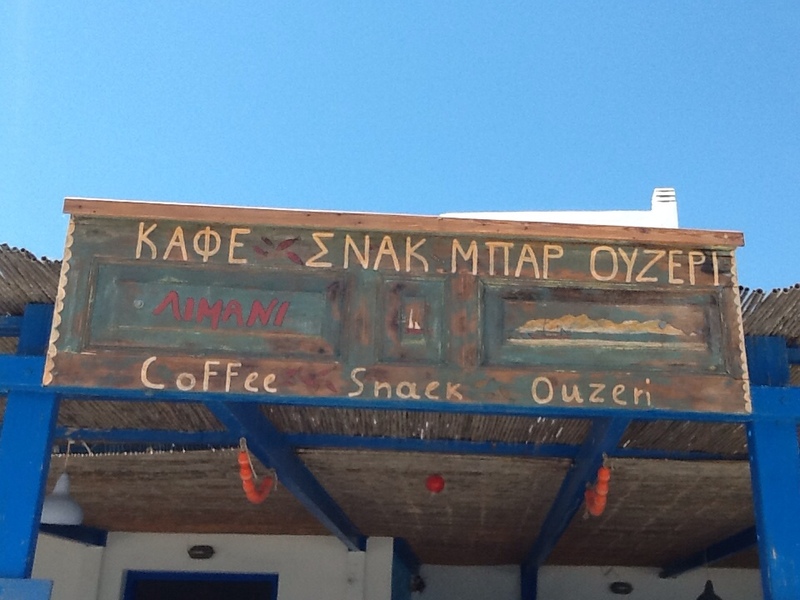 YM, BL (or 'Wee-lee-am' as he'll now be known) and I are sitting in 'Limani' cafe at the port in Koufonisia, waiting for our 12:50 pm seajet ferry to Naxos to arrive….and waiting….and waiting…and waiting. The wind, or Meltemi as they call it here, which has been blowing non-stop for the last few days, seems to have picked up, and is now blowing a gale! Waiting at the Kafe Limani, Koufonisia port...Florian, the bringer of bad news is in the background on left! He told us to go to the Ferry Ticket office to change our tickets for the ferry that was supposedly coming in 30 minutes. The ticket office is only about 500 metres away, but up a really steep hill leading to the Chora ( The town). I should add here that my mate BL ('Wee-lee-am') had booked a return ticket on the same ferry, and was going to come over to Naxos with us, to have lunch together at Mixali's Restaurant 'Scirrico'. He was then going to catch the same ferry back to Koufonisia at 4pm. BL and I headed up the hill to the Ferry Office to find out the details of the next ferry….The two ladies in the office well aware by now that our 'SuperJet' ferry had been cancelled, (apparently because the seas were too rough!) and as soon as I showed her my tickets, she opened the till and withdrew the 58 euros I'd paid her a few days ago and placed them on the counter. ” But I need to get to Naxos before 5pm I told her. She gave that 'very Greek' backwards shrug of the head that indicates ' your problem, not mine'. What about the ferry that Florian had told me was coming in “maybe 'alf hour'? She patiently explained to me, in a mixture of greek and broken english, that there was indeed a ferry coming in 30 minutes, but it was going in the opposite direction to what we wanted to go…. 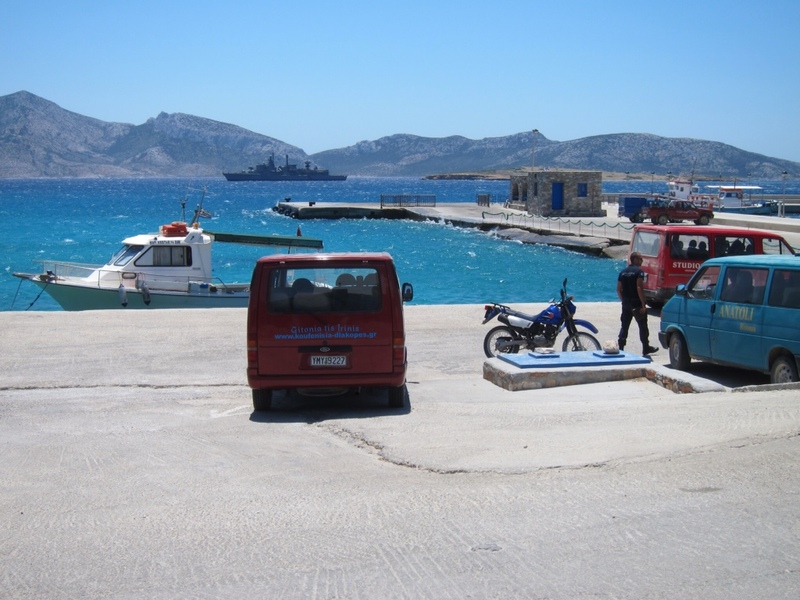 not to Naxos, but to Amorgos. 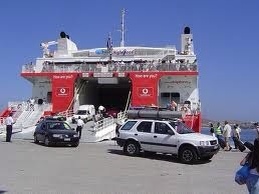 The next ferry to Naxos was leaving at 5:30pm…too late to make the connection for sure!!! “What can I do” I asked….. was answered by that backwards shrug of the head again. 'Wee-lee-am' and I made our way back down the hill to the port cafe, to find that Florian had dumped our luggage on the dockside and dissapeared…. but Yineka-mou was still anxiously waiting, and I gave her the old ” good news or bad news” routine…. 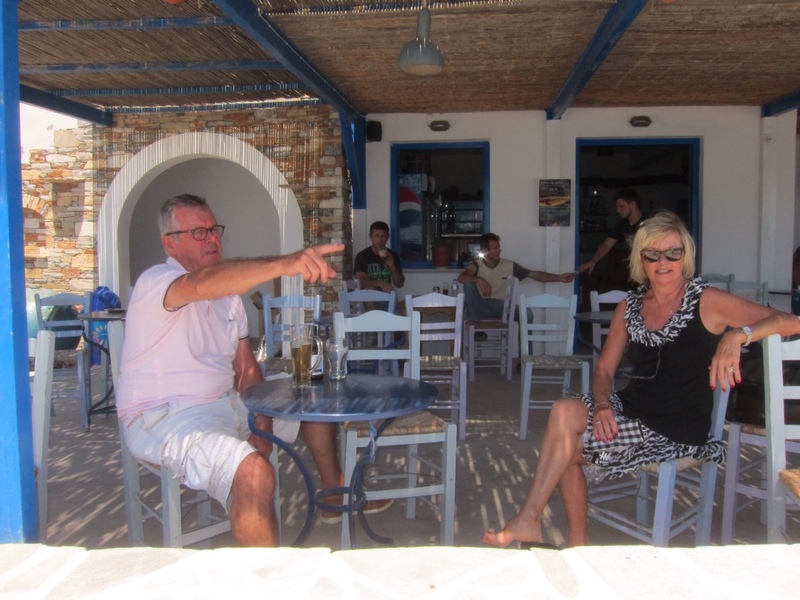 “Well, the good news is we have arranged a boat across to Naxos” and the bad news YM asked…..” The bad news is….the ferryboat was cancelled because of bad weather conditions”. YM looked more than a little alarmed “What boat are we going in?”… 'Captain Costas boat' …. ” Mmmmm, is it safe?” ….. 'of course it is, Costas knows what he's doing' ….. I wasn't too sure myself about the safety aspect, as the sea outside the harbour was pretty choppy….lots and lots of whitecaps…and the wind still picking up…but I wasn't going to let my fears be known to YM. While Yineka-mou popped up to the bakery to get something to eat, (something to line her stomach, was her excuse) Wee-lee-am' and I had time for a couple more beers. YM came back with a ham & cheese pie for me, and a toasted ham & cheese sandwich for herself. 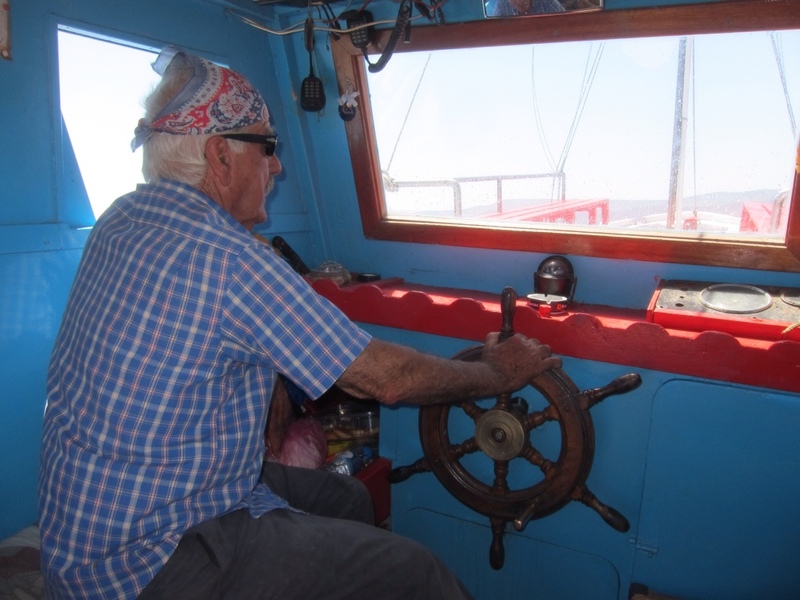 We kept a lookout to sea for any sign of our lift, and just after 2:15 we saw a little boat, bobbing about in the swell, but heading in our direction….it was Captain Costas, returning from Kato, in his pretty little traditional wooden greek 'Caique' or fishing boat. 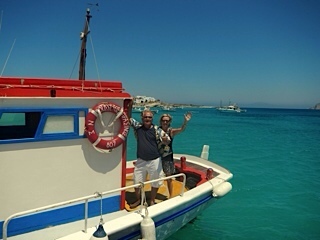 Now under normal conditions the trip from Koufonisia to the tiny little harbour on the southwest of Naxos island, should take only about 20 minutes…. but these were far from normal conditions. At first Captain Costa hugged the coast line of Koufonisia in order to stay in the lee of the island and to avoid heading out to the rough seas…. at times he came perilously close to the rocks….. but he'd been doing this for at least 60 years, so I had confidence he knew what he was doing. 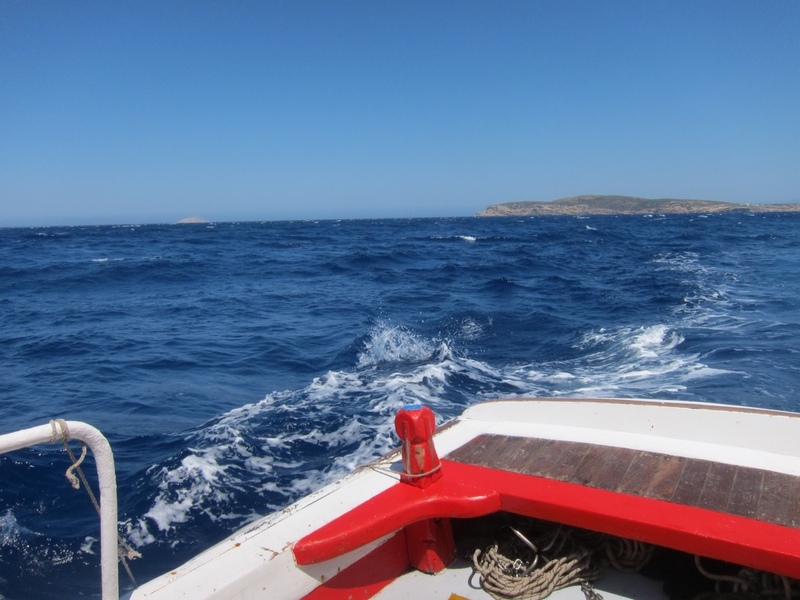 About half way across, and with the swell picking up ( the wind was being channelled between the two islands) Costa asked again if we were OK…. actually, he only asked if YM was OK. He then told me he was going to change course, and run with the sea, and head to a small harbour further up the coast, instead of the usual harbour of Volakas… it was too dangerous to try to cross the channel 'beam-on' to the swell. 'Endaxi?' he asked…. “Nai, endaxi” ( yes OK) I replied. Whatever you say Captain Costas! Running with the sea, halfway between Naxos and Koufonisia. 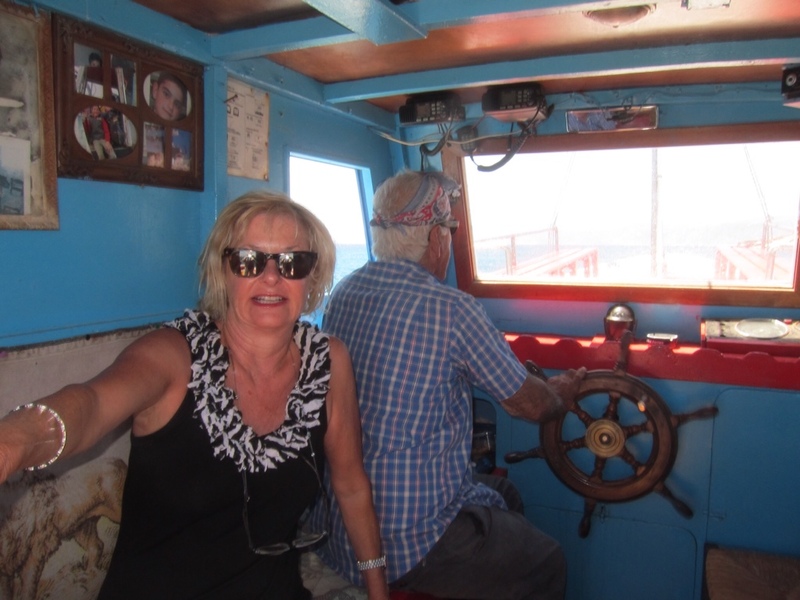 It was a good decision on his part, and about 15 minutes later we were hugging the coastline of Naxos, we were in the lee of the island…and the seas became calm…. we turned into a beautiful small horseshoe shaped bay named Panermos, ringed by palm trees and beaches…..I could see a taxi waiting up on the cliff, and on the beach the cab driver was waiting to help us disembark. Costas told me to go below and haul up our luggage, and while this was happening, and unknown to me of course, he took the opportunity to say goodbye to YM with big hug ( a BIG hug!) and a big kiss ( a BIG kiss!) …. I dragged our suitcases to the bow of the boat, and Costas pointed the boat towards a small concrete 'landing'… no way could you describe it as a jetty. I paid Cap'n Costas the 50 euro, plus a 10 euro tip….I doubt that anyone else would have gone to sea in those conditions for a mere 50 euro…. and now he had to make the journey back to Koufi …. and this time sailing INTO the wind. Thanks Cap'n, for helping us out of a real dilemma…. I passed my luggage down to Nick the cabdriver, and he then helped me as I clambered over the side of the boat. 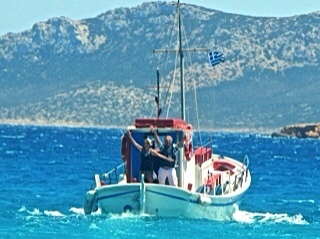 With Costas pushing, and me pulling, we manhandled Yineka-mou over the side and on to dry land….well, a wet beach actually… 'επιτέλους φτάσαμε με ασφάλεια' meaning 'at last we arrived safely' …. “Don't speak to soon son” I remember my Dad telling me often enough. The HighSpeed4 ( is that really the best name that they could come up with for a ship?) is a large catamaran which can carry 188 cars and 1008 passengers, and has top speed of 35 knots. Even better, it was built in Fremantle, at the Austal Shipyard in Henderson, and that makes me very happy, so should be a safe trip at least! I'm happy to say that we did have a very comfortable, and very unevenful trip back to Piraeus on the HS4, and after just the one stop at Paros, we arrived on time at 9pm. 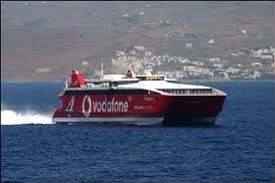 Arrrival at Piraeus on Highspeed4. 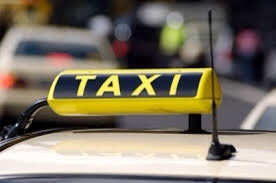 We caught a cab to Athens, to our favourite hotel there, The Fresh Hotel, in Sofokleous St. The only weird thing about the cab ride was that we were forced to listen to Shirley Bassey for the whole 25 minute journey…. the cab driver was an avid SB fan…. He told me he liked her voice…. as he couldn't speak any english, I wonder what he thought the songs were about….. and it was more than a bit disorienting listening to 'I, I who have nothing' as we drove past the Acropolis, into Syntagma Square. Like a lot of Athens cab drivers, this one also couldn't add up properly…on arrival at the 'Fresh' the fare shown on the meter was 11.50 euro, but to 'Bassey boy' this was far less than he wanted… he explained that there was a 3 euro 'port' fee, 2 euro per bag luggage fee, a 'sunday fee' and maybe a 'tip' fee… 24 euro efharisto! I handed over 25 euro, he thanked me very much ( Efharisto para poli) , didn't wait to give me change, but drove away down Sofokleous St with Shirley Bassey belting out ' Hey big spender' on his car stereo….. Mallacca!